which will either escape or remain bounded. The difference between this calculation and that for theMandelbrot set is that the real and imaginary components are set to their respective absolute values before squaring at each iteration. The mapping is non-analytic because its real and imaginary parts do not obey the Cauchy–Riemann equations. 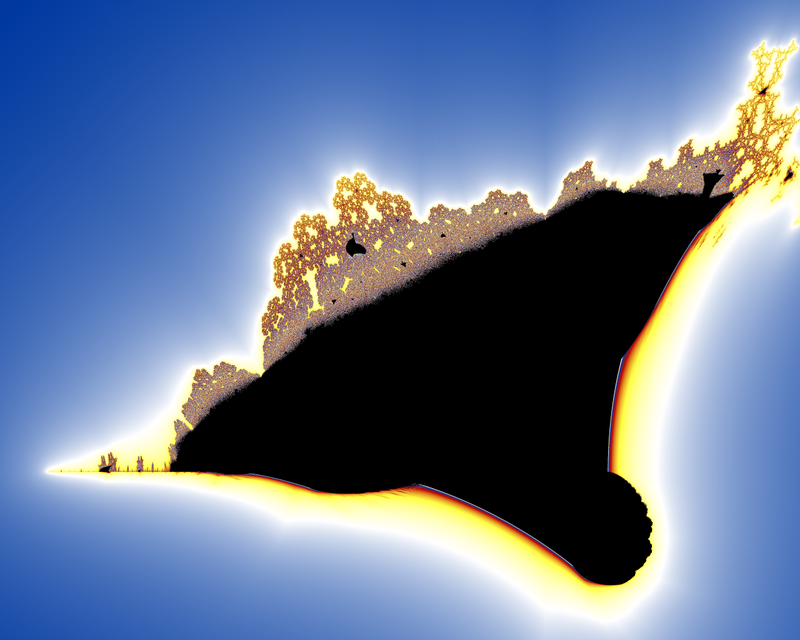 A zoom-in to the lower left of the Burning Ship fractal, showing a “burning ship” and self-similarity to the complete fractal. A zoom-in to line on the left of the fractal, showing nested repetition (a different colour scheme is used here). High quality image of the Burning Ship fractal. The Burning Ship Fractal featured in the 1K intro “JenterErForetrukket” by Youth Uprising; a demoscene production. A Corresponding Julia Set of Burning Ship Fractal.